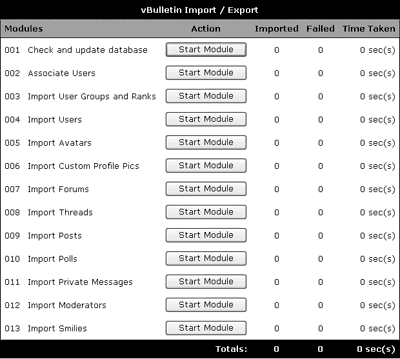 Hello, I'm trying to move my previous forum to vBulletin, but I have some issues that I can't solve. I've been completing each of the steps found in the online manual (http://www.vbulletin.com/docs/html/impex) but I'm unexpectedly stuck at this step http://www.vbulletin.com/docs/html/main/impex_import in which I will explain in further detail. Once I select the system and select the version and product to vBulletin 4.0. * and click "Begin Import", instead of showing this http://files.vbulletin.com/doc_image...ex_modules.png the page only refreshes and no action is taken. Everything seems untouched and no matter how many times I try to click "Begin Import" I get the same result. Both databases are intact. Is there any explainable reason for this? I modified very carefully the ImpExConfig.php file so I know all the values that I changed were valid. Last edited by Kento; Sun 5th Jun '11, 9:31am. Since no one replied I decided to reinstall everything in another server, my previous issue was solved thanks to my deduction. But now I encountered something very odd while using Impex. Right now I have a fresh-installed forum with no members but me. So I'm the only member (user ID 1 obviously), and lets say my email is abc@gmail.com in both the old and my new database. 1 NOT done. It is most likely that vBulletin user 1 dose not exist. How is this possible? All first forum accounts are number 1, and this is no exception my admin account is indeed 1, but Impex says it's not...! And when I Import users even if my original account and my new account have the same e-mail they don't associate (I did select Yes to "Would you like to associated imported users with existing users if the email address matches ?). Did you set your admin user account in vBulletin to be unalterable within the config.php file? No I didn't, this is how I have it. I must also say that I've only modified database related lines within the config.php file. Nothing more has been changed. Please include a complete description of the problem and be sure to include the login info to your Admin CP, phpMyAdmin and FTP in the 'Sensitive Data' field. Kento, what was your fix for this error? All times are GMT-8. This page was generated at 6:43pm.